Assortment of 4 cartridges, not a box: of the above pictured products: 45 ACP (FMJ), 2 different 9mm Luger (FMJ & JHP) and 380 Auto (FMJ) with the special “P-1" head-stamps, that were produced by Precision ONe* Ammunition Company around 2010; they are no longer available from the manufacturer. 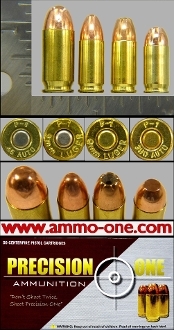 Precision ONe Ammunition Company was founded in 2008 by Jeffery O’Neill, Charleston, SC 29492. They later moved to a brand new manufacturing facility at 2071 Wambaw Creek Road, Charleston, SC on April 2, 2015. The company's goals are to bring a consistent and accurate round to the marketplace. * the ONe is not a typo, it is the way they have it spelled on their web-site.